Phinda Forest Lodge is located in the Phinda Private Game Reserve, KwaZulu-Natal, South Africa accommodates guests in glass-encased suites with luxurious en-suite facilities. Escape to &Beyond Phinda Forest Lodge, a safari lodge set in the heart of a rare Dry Sand Forest, and find peace and tranquility. 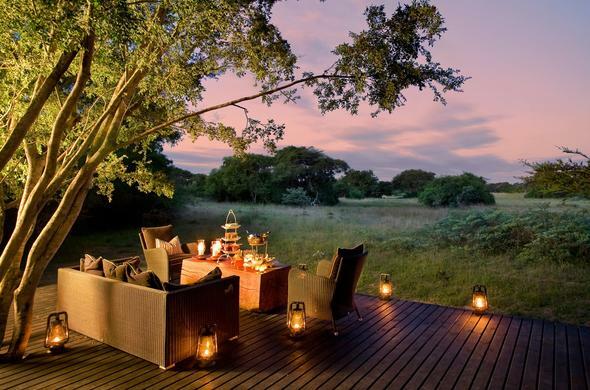 The spectacular stilted suites of this award-winning lodge are an exemplary exercise in building eco-friendly structures, providing you with excellent service and hospitality in Phinda's South Africa accommodation all year round. Phinda Forest Lodge has luxury suites with magnificent en-suite facilities, offering South Africa accommodation to a maximum of 32 guests. Game viewing is wonderful all year round, but the best game viewing ranges from March to the end of September. All the suites at Phinda's South Africa accommodation have been furnished with air-conditioning, heating, room fans, mosquito protection, indoor showers, in-room safes, personal bars, telephones and hairdryers. Guests staying at Phinda Forest Lodge gain insight into the Zulu culture, crafts, history, traditional and modern day living. Embark on unforgettable day tours to local communities, delight bush breakfasts, experience lavish banquets and remarkable Zulu-Zen architecture are all apart of your stay at Phinda. Phinda Game Reserve is situated in a low-risk malaria area, however necessary precautions should be taken before arriving to your South Africa accommodation. Children are welcome, although triple rooms are not possible as a South Africa accommodation option. Unfortunately, children 5 years and younger cannot participate in game-drives. Baby sitters are available at extra cost. Children aged 6 to 12 years may go on game-drives at the lodge Manager's discretion. Private Family safaris available.